Free running through a dream, leaping over crates, running along walls, dashing through gaps, Requiem is a slightly marred look at what Mirror's Edge could have been on the iPhone. In Requiem you play a boy lost in a nightmare world chased by a raging bull, collecting stars on his way to a pegasus read to fly him to the next level. What makes this platformer so unique is that instead of traversing across the screen from a point of view that scrolls left or right as you move, you take the levels on from a first-person perspective, as if you were the boy running through the cobble-stoned streets of his nightmare. The gameplay is fairly straight forward, with players using their left thumb to maneuver right, left forward and back, and buttons on the right side of the screen to jump, crouch and sprint. I've played through about half of the game's 14 levels, finally hitting a level that has me plummeting to my death over and over and over again. It's a reminder of how difficult it is to not only deliver a fun first-person platformer, but to do so on a device that has no physical controls. Perhaps this is why Electronic Arts decided not to make their iPhone version of Mirror's Edge first-person and opted instead for a side-scroller. I found myself, in this last level, increasingly frustrated with the seeming imprecision of the controls and the slight float of my movement while in a jump. Perhaps it's a part of the play, something intentionally built into the game, but I find it more annoying than challenging. Platformers, no matter how precise, can be a frustrating genre to play at the worst of times, though. And Requiem does have some neat moments. 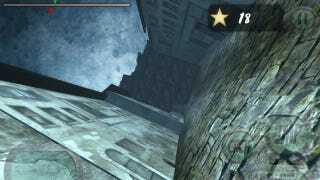 The level design, which has you running down a cobble-stoned street bordered by high buildings, becomes increasingly surreal as you advance through the levels. The one that cost me my life so many times had the town's street sloping and tilting until it become the wall, the buildings the ground upon which I ran. It had me jumping along floating boxes and ducking through gaps in walls of crates. There are also hidden items that can be collected to unlock a bonus level that allows you to guide the pegasus.